The Boston Globe editorial board on Friday called on Sen. Elizabeth Warren to "put all the facts about her past in front of voters," in the wake of a report that the Massachusetts Democrat identified herself as "American Indian" on her registration card for the State Bar of Texas in 1986. "Warren grew up believing she was part Cherokee. But answering the question the way she did was a mistake, even by the standards of 1986," the editoril board wrote. "Warren's never been a member of any tribe. She's white. Playing loose with the facts about identity is bad within the current political climate of the Democratic Party, where issues of race have come to the fore." 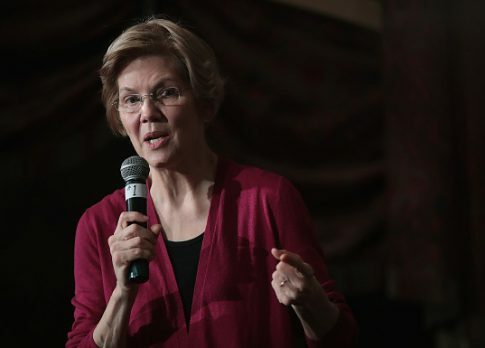 "If Warren can't stop the slow bleed of bad news now, the presidential candidacy she is expected to launch in Lawrence on Saturday is going to go nowhere fast," the editorial continued. "To unseat Donald Trump, Democrats need to put up the strongest candidate possible, not another wounded one. A polarizing figure, Warren already faces headwinds that complicate her candidacy." Warren apologized earlier this week in an interview with the Washington Post after the story about the registration card broke. In 1984, Warren contributed five recipes to a "Pow Wow Chow" cookbook in Oklahoma and was identified as "Cherokee" under each of them. Two years later, she listed herself as "American Indian" on the bar registration card. From 1986 to 1995, Warren listed herself as a minority in the Association of American Law Schools desk book. It was reported in 2012 that Harvard Law School officials touted Warren as a minority hire on their faculty. Last October, Warren released DNA test results showing that she was anywhere between 1/64 and 1/1,024 Native American, prompting anger among Native Americans and progressives. "The best thing Warren can do—what she needs to do—is put all the facts about her past in front of voters," the Globe‘s editorial board wrote. "The senator needs to search not only her records but her conscience to end the drip-drip-drip of fresh revelations. Only Warren knows how much worse her political travails can get. For the sake of her campaign—and of her party, should she end up winning the nomination—any further revelations must come from her." "And oh, there's one more thing and it's unbelievable Warren hasn't done it yet: Deliver an honest apology publicly," the board added. This entry was posted in Politics and tagged 2020 Election, Elizabeth Warren, Native American. Bookmark the permalink.